Vroom International August 2018 out now! The CIK sports commissioners became protagonists in judging as irregular a fortuitous contact between De Conto and Celenta, thus undermining the epilogue of the European KZ. A precedent that will further affect future karting competitions. What happened in the Italian Grand Prix, final event for the awarding of the European title, is paradoxical. But first, the facts. In the KZ Final, Francesco Celenta, leading the race, is being chased by Paolo De Conto, who is visibly faster than Celenta. During Lap 8 of the 25 scheduled laps, on the track's penultimate corner, a hairpin to the left, De Conto dives on the inside and his right front tire and kart # 14's side and left rear come into contact. The karts tangle, lose momentum, but both race on, regardless, and unharmed with De Conto leading in front of Celenta. The judging panel, despite immediately putting the episode under investigation, emits its verdict only after the awards ceremony. It reads: "[...] Having considered the report and the related video sequence, the judging panel reputed this incident a violation of the Code of Conduct. This decision is adopted pursuant to Article 2, paragraph 24, of the CIK General Prescriptions and article 12, paragraph 3, of the FIA ​​2018 International Sporting Code [...]. "The sentence, with no chance to lodge an appeal, is a blow to De Conto who not only loses the race, but worse - above all - loses the title to Jorrit Pex. De Conto, however, is not the only loser of the day. To this list, we must add the perception that CIK has of karting, that is, one that is light years away from what is the reality on the ground. Or on the track. This discipline has always been considered a training school to prepare drivers for track competition. The school of karting – karting, itself - allows drivers to assimilate driving and racing skills thanks to its shorter and faster reaction times required to deal with sudden changes in trajectory and to play, compete and race on far closer distances, a fact that often makes incidental contacts inevitable. Furthermore, the move that they considered as unsporting conduct by De Conto on Celenta in the 2018 European's final round was so clearly and obviously a routine - and accidental - contact, that is, and I repeat: wholly fortuitous, as so often happens in a race. Slower at that moment for, it seems, a drop in power, Celenta was defending himself from De Conto's attack. But we were not on the final's last lap for one to interpret or decide a contact, although fortuitous, was however decisive for the victory; instead, we were only at the Lap 8, that is 1/3 into the race, with two-thirds to go; kart permitting, whomever submits to a pass has all the time to catch up to their rival and retake their position. This questionable decision has created a precedent that may be used as a premise for any future conduct in violation of the Code of Conduct. Thus, after imposing the detachable bumper issue, now contact the side and / or between wheels will also affect karting's queen class. One should certainly not have to be teaching a professional driver, including De Conto or Celenta, how to behave in such a titled competition, being – as they are - mature and experienced drivers, as most drivers in KZ are. After all, the history of karting is made of compelling races decided by passes and moves often beyond the limit, and these same moves have become part of the Mos Maiorum of the discipline, the stuff of legends. Why even Senna and Schumacher, as F1 world champions, continued to train in karting, and why this motorsport continues to form and train the drivers who today make their mark in racing, not just in F1. PS. We would like to know the reason why the verdict was issued so late, even as late as to follow the podium celebrations. A lack of respect to the driver? 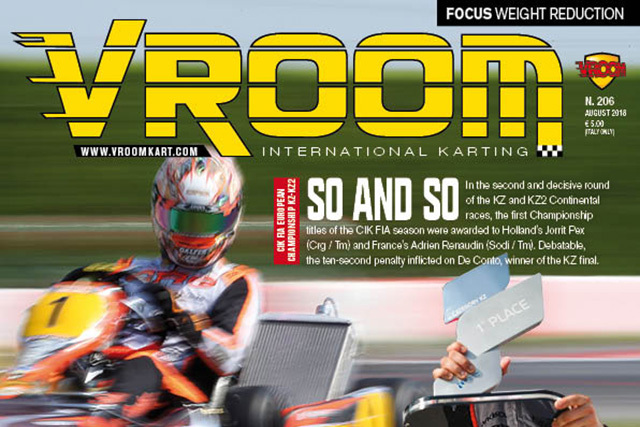 Certainly not the best image for an event regulated by Cik Fia of such importance.